Be respectful of others, and stay away from personal insults. Don’t call people nasty names. Talk about the issues, not the people. 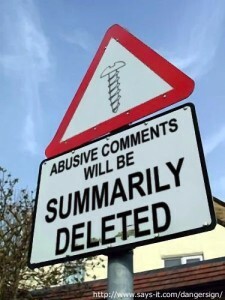 If you find yourself mentioning what you think someone wrote a comment you disagree with, stop immediately and hit delete. Correct others humbly and with meekness. Read carefully. Listen. Cut other some slack. Assume others are friends, not enemies, and interpret their comments according to the best possible spin. Stay away from “Shut Up, That’s Why” arguments (designed to shut down the discussion rather than address it). I try to pursue these ideals, not always successfully. Please point out how I have lost sight of my vision for this site, but please do so as gently as you can muster.